Driven by the demands of research and the entertainment industry, the techniques of animation are pushed to render increasingly complex objects with ever-greater life-like appearance and motion. This rapid progression of knowledge and technique impacts professional developers, as well as students. Developers must maintain their understanding of conceptual foundations, while their animation tools become ever more complex and specialized. The second edition of Rick Parent's Computer Animation is an excellent resource for the designers who must meet this challenge. The first edition established its reputation as the best technically oriented animation text. 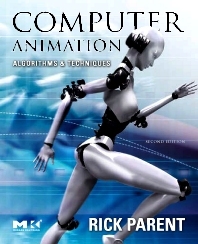 This new edition focuses on the many recent developments in animation technology, including fluid animation, human figure animation, and soft body animation. The new edition revises and expands coverage of topics such as quaternions, natural phenomenon, facial animation, and inverse kinematics. The book includes up-to-date discussions of Maya scripting and the Maya C++ API, programming on real-time 3D graphics hardware, collision detection, motion capture, and motion capture data processing. New up-to-the-moment coverage of hot topics like real-time 3D graphics, collision detection, fluid and soft-body animation and more! Students studying computer animation in courses with an emphasis on understanding algorithms and programming. Technical directors, animators, artists, and game developers looking to understand the foundations of animation to improve studio work.